It was a warm night and but a very cold south-westerly wind is blowing this morning. Today we do not have all that far to go, especially as we have travelled further the past two days than originally planned. 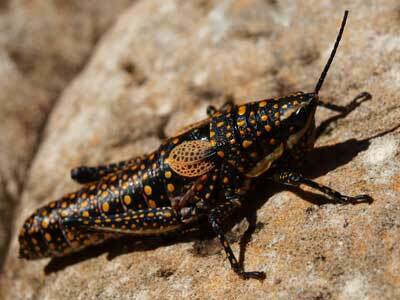 This means we should have a lot more time to spend in the East McDonnell Ranges. However, we do not know the condition of the roads ahead. In fact I have only been able to find one small article in a 4WD magazine that mentions Cattlewater Pass briefly. We get up at 7:30 am and leave at 9 am. Before this, Kelly and I climb the rocks to the west. Quite stunning views from here. 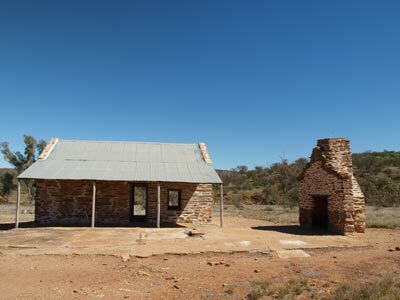 We are heading towards Arltunga, an old ghost town, now Arltunga Historic Site. Cattlewater Pass is not the best road. In fact, it is more a track. Kelly is driving and she only sits on about 40 km/h at the best. At this rate, it will take about two hours to reach Arltunga. At 10:10 am we come into a more open valley than the previous very rough terrain. 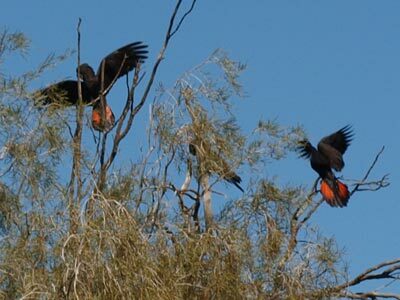 On the right we see a couple of dozen red-tailed black cockatoos on the ground and in a tree. They really are a beautiful bird. At 10:45 am we come to an intersection. 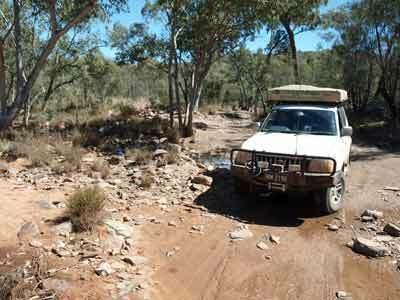 Right leads to Old Ambalindum Station which has accommodation and camping while left goes to Claraville and Artlunga. We turn left, having taken 105 minutes to travel 40 kilometres (25 km/h). 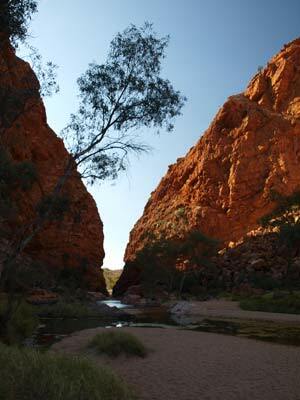 Our original plan was to bypass Arltunga today and travel onto Ruby Gorge. However, the rain in mid and late July have damaged the road in and it is still closed. At 11:10 am we arrive at Artlunga Intersection. It has taken just over two hours to cover 57 kilometres (26 km/h). We have morning tea here while examining the ruins. There are the ruins of the bakehouse and the foundations of the Glencoe Hotel, with bits of broken bottles, China and metal. 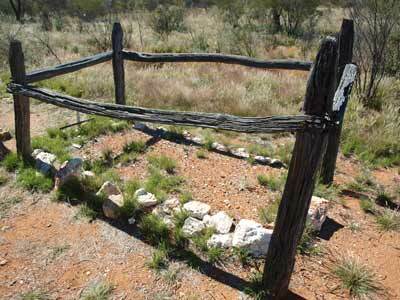 At 11:40 am we drive 500 metres to the cemetery which has five graves and then 1.8 kilometres onto Jokers Gorge and Mine. We walk to the mine building ruins and the start of the gorge. Not amazing, but nice. There is also a picnic table and chairs here but there is no camping anywhere in Artlunga. At 12:05 pm we leave and drive to the main ruins. Here there is the Police Station and cells, restored to a certain degree. 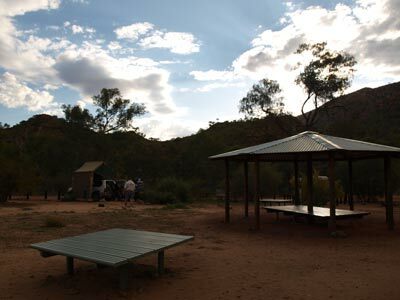 There is another nice picnic area here, a pity it is not a camping area. We only spend 10 minutes here and then drive to the visitor centre. We get there at at 12:25 pm. There is an excellent visitor centre and we have just missed a practical display related to the mining. We depart at 12:52 pm and a couple of minutes later pass the now closed Arltunga Hotel and camping area. 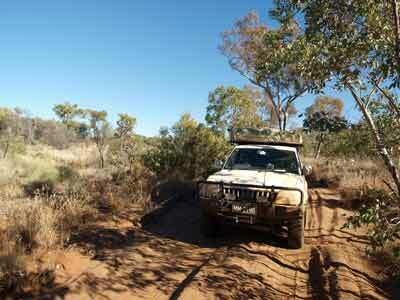 At 1:30 pm we arrive at the Ross Highway (from Alice Springs) and turn left. Tar again! Kelly wants to have lunch at the Ross River Resort. We drive there but find that it is certainly not what we would call a resort. It looks more like a school retreat location, very down market. In any case, there does not appear to be anywhere to eat, or at least it is not obvious. We decide to make lunch ourselves. We head back to the intersection that leads to N'Dhala Gorge. We cross the Ross River. It is at least a few hundred metres wide here and the road is 4WD only. We pass the Ross River Resort camp ground (looks better than the resort!) and stop at the second crossing of the river. It is 1:42 pm. 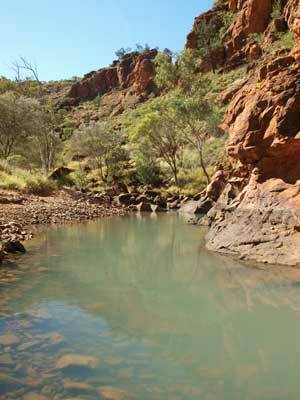 We have lunch and watch the kids from Alice Springs play in the water in the river (it is only a very small flow). We leave at 2:05 pm and continue south. There are a total of seven crossings of the Ross River, one of which you have to drive a fair way back up the river to get to the other side. Obviously, in the rare times there is a lot of water flowing in the river, this road is inaccessible. As we approach N'Dhala Gorge Nature Park (not sure why it is not a proper national park) we stop and cut some firewood. The countryside is really quite spectacular. 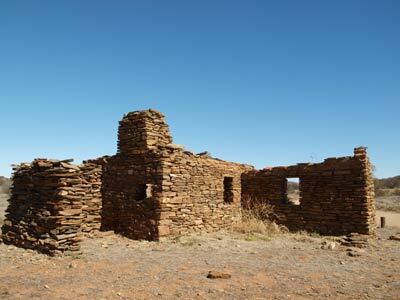 There are a few mesas as you turn off the road to the park's access road. We arrive at the camping area at 2:25 pm. It is a nice day, 21.5ºC and there are quite a few cars parked here. This is also the parking area for the walk to the gorge so we cannot set up camp yet as the only real spots allocated for camping are taken and the other spots blocked by cars. We decide to do the walk (except for Tomas) and set off at 2:45 pm. This is an easy 75 minute return walk along the sides of the creek. We go further than the marked trail, but there is not much more to make it worthwhile. There is a considerable amount of water in the gorge, the result of all the recent rain. 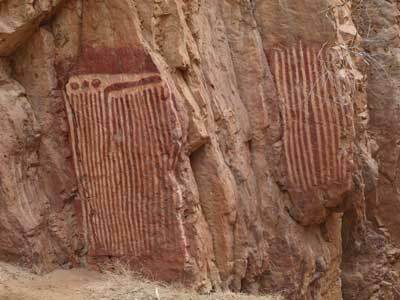 There are lots of Aboriginal art along here. 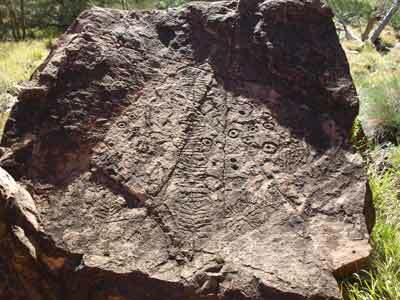 They are petroglyphs, that is, peckings, made by using a hard pointy rock to carve a design into a softer rock. 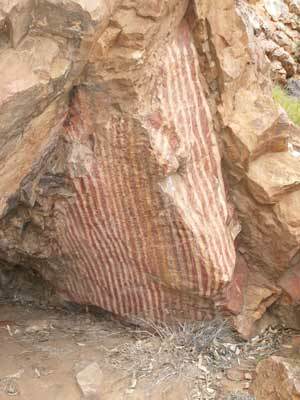 The style is similar to those I have previously seen at the Cullyamurra Waterhole at Innamincka. There is also an interesting rock that looks like the head of a dinosaur or huge turtle. It also has a "mouth". Kelly climbs inside while I take a photograph. N'Dhala Gorge Kelly inside the "mouth" of the "dinosaur"
We are back at 4 pm and most of the cars are now gone. As mentioned, the camping area is very small, way too small for its popularity. It is also poorly designed, with just three spots dedicated to camping. Each of these has a table and barbecue, but to get to use them for others would be intrusive on the ones camped nearby. We decide to camp on the other side of the car park where there is a little flat and cleared area that Peter F and Tomas can erect their tents. We all have hot showers using the Twine shower in our car. We decide to create a fireplace on the car park so we can cook dinner and have a warm fire. At 5 pm we have nibblies and drinks and at 7 pm Kelly makes a chicken and pesto pasta meal. Afterwards, we have the remaining sticky date puddings Kelly made last night. We are in bed by 9 pm and read for 30 minutes (holidays are the only time I get to read books and I will knock over two complete novels as well as some magazines on the trip). It was a very cold night, the coldest since the second night. We only have a very short distance to travel today, about 50 or so kilometres. Accordingly, we have a very relaxed start to the day, although I get up at 7:30 am. We have breakfast and afterwards, Kelly does the walk again, this time with her Dad, Tomas. They do the normal walk which only takes them 50 minutes. We leave at 9:30 am and drive back towards the Ross Highway. We stop to cut some more wood for tonight's fire and top up our shower water from the Ross River. 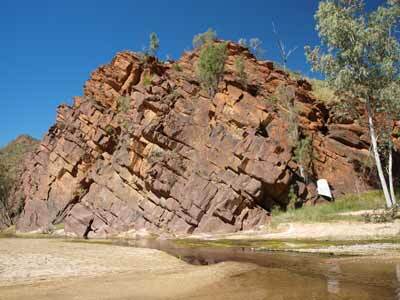 Once on the highway it is only 10 kilometres to the turn off to Trephina Gorge Nature Park. This is where we plan to spend all day as well as tonight. 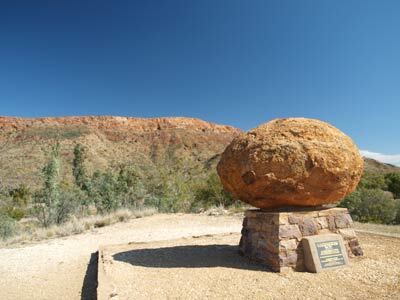 Just before the road to Artlunga, we stop at a memorial we had seen the day before. 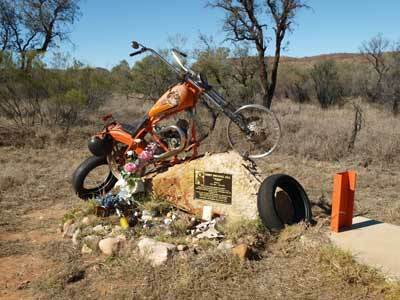 This has the remains of a Harley Davidson chopper mounted with a plaque and photograph. It is for Terry "Fish" Michael Gill who presumably died riding this bike at this location. There are a couple of dozen unopened beers there as well as lots of other memorabilia. 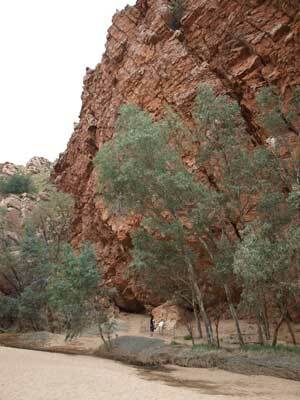 It is only 34 kilometres to the turn off to Trephina Gorge. 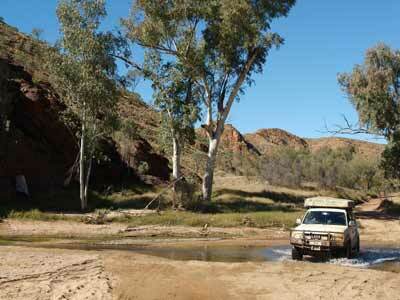 We decide to check out John Hayes Rock Hole which is one of the camping areas. This is on a 4WD only track, although we later encounter a Korean couple in a RAV4 coming in. At 10:48 am we arrive at the parking area, four kilometres down this track. It is quite a rough road, with it taking 20 minutes to travel the four kilometres (average 12 km/h). 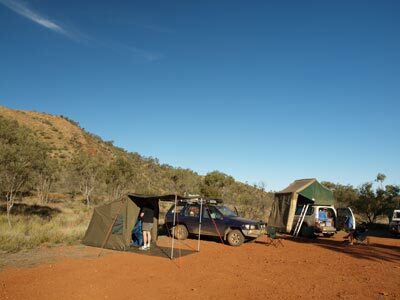 The car park is full and as we may camp here tonight, we park back in the camping area (Rockhole Campground). It is a nice spot but the only other person there turns us off staying. His wife is raking (yes raking) the area around their camper trailer and he is quite obnoxious. No, we will not camp here unless the other camping areas are full or really bad. 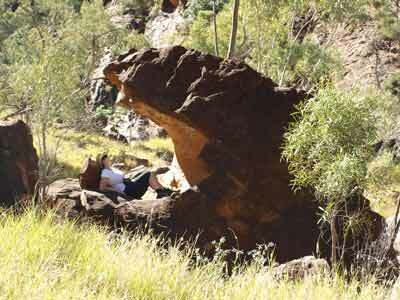 There are a couple of places to camp in Trephina Gorge so we have a few to choose from. We had decided to check on them all before making a decision as to where we would stay the night, but this bloke has made it easier. There are a couple of walks, one the longer Chain of Ponds Walk and a shorter one to a lookout. We decide to only do the shorter one as there are others to do further in the park. 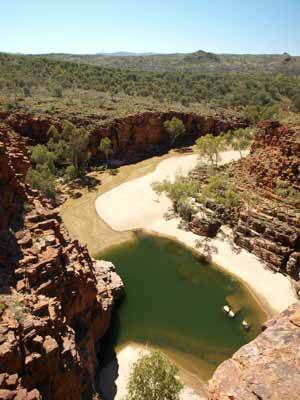 It is an easy 10 minute walk to the lookout which gives nice views of the gorge. 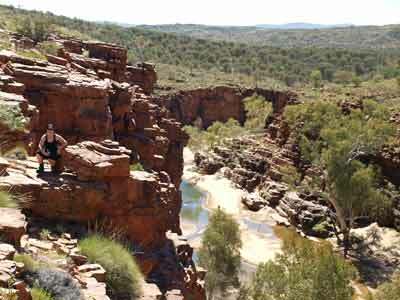 We also walk the 100 metres to the start of the gorge itself (you cannot get any further). We return back to the car at 11:30 am and drive back to the main park access road. 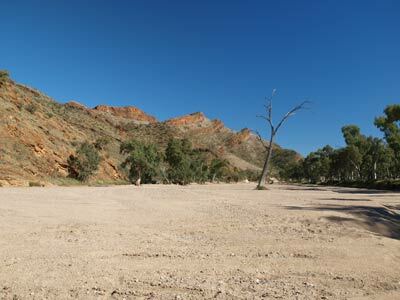 This leads further into the park to the other camping areas as well as Trephina Gorge. 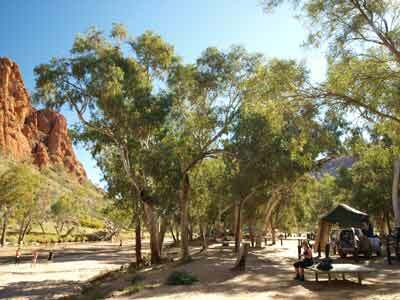 We check out the Bluff Campground on the way past and are fairly impressed. We mentally pick out our site. We continue on in and look at the Gorge Campground. From this location there are a number of walks you can do. The Gorge Campground is too crowded with large motorhomes and caravans. We are not impressed so we decide to camp at the Bluff Campground. We return back to there and set up on the northern-most site. 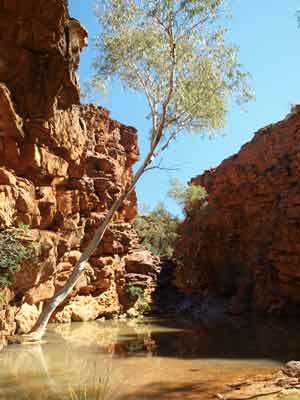 This is on Trephina Creek which is about 80 metres wide and has water running on the far side. It is well set up, with toilets, wood and free gas barbecues and low seats/tables for each site. It is a far better set out camping area compared to N'Dhala Gorge. We set up camp at 12:05 pm and then have lunch. It is only a short walk from the camping area to the start of each of the walks, so it is a good place to stay. 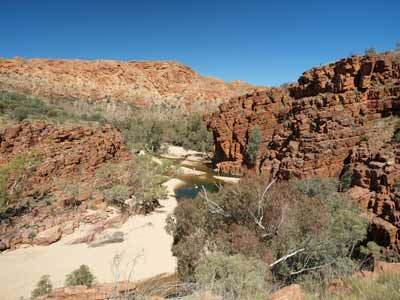 At 12:40 pm Kelly, Peter F and I head off to do the Trephina Gorge Walk which is said to take one hour. It only takes 10 minutes to walk to the start of the walk from our camping area. 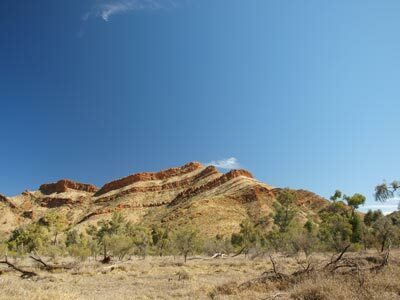 This walk goes up the southern sided of the gorge and heads west. It is an easy walk, with only a short section at the start a bit steep. There are excellent views of the gorge. 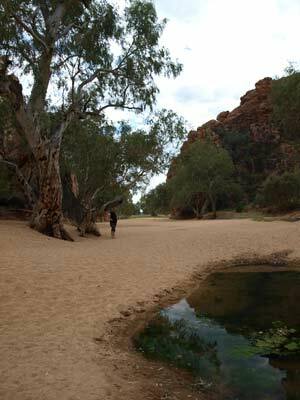 The walk circles around the western end of the gorge before coming back into the sandy creek that runs through the gorge. 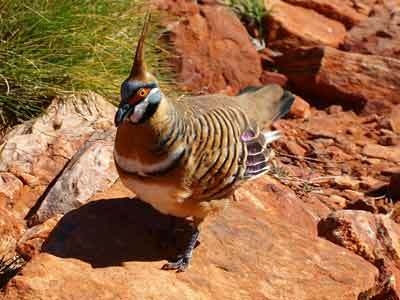 On the western end we find a Spinifex pigeon that is so friendly, in walks right up to our feet. Here we have to cross the creek which although shallow, is quite wide. I discover that my almost new Cat walking boots are already stuffed, as I get water in through a crack. We walk back to the starting point and have a rest. It was one hour exact back to here, although we stopped lots of times to look at things and could have done it in 45 minutes. Peter F heads back to camp while Kelly and I do the Panorama Walk. This walk, as you can imagine, takes you up to a hill to the north of the gorge. This is a bit steeper and higher and harder, but still a relatively easy walk. Once at the top we get 360º views. It only takes us 45 minutes to get back to the creek and another 10 minutes back to the Bluff Campground. Both excellent walks and highly recommended. By now we are in need of some rest, having done about 2.45 hours walking today. We head back to our campsite and have a cuppa and a break. We are back at the camp at 3:05 pm. Kelly decides to take Tomas back to do part of the Gorge Walk so they head off in Peter F's car (ours, of course, has the roof top tent already set up). I read for a while and at 4 pm I make some dough for the pizzas we are having for dinner tonight. As we are having pizzas, I have to get a good fire going so we can get some coals to use on the camp ovens. I start the fire at 4:30 pm and later also preheat the ovens by putting them on top of the fire to heat the metal. Five o'clock sees the drinks and nibblies come out as I start to make the pizzas. 1 tablespoon sugar Mix together with a knife and then knead by hand. Once all mixed, place under a tea towel to rise. Leave for about 90 minutes and then cut into six pieces. Roll out to shape with a beer can or stretch using your hands. Place on oiled aluminium foil. Add tomato paste, cheese and whatever toppings you want. We save a small amount of salami (from nibblies), chicken (from stir fry), onion, capsicum and top off with Italian herbs and more cheese. I also add a few drops of my home made chilli sauce. We also use whatever else we might have left, perhaps even some pineapple. I make two garlic and cheese pizzas as entrees and four proper pizzas. We place the pizza in a modified cake tray which has holes in its top edge to enable it to be lifted in and out of the camp oven. We put the tray in the camp oven and cook for about four or five minutes. It should be done that quick if the oven is hot enough. One of these pizzas should be enough for one person. We normally make three different pizzas, eating one third of each per person and keeping the rest for lunch the next day. We have had pizzas out in the middle of the Oodnadatta Track, at 1200 metres in the Victorian High Country as well as in Outback NSW. A brilliant meal. After dinner we sit around the fire before going to bed at 9 pm where we read for a while. A very enjoyable day. It was quite warm during the night compared to previous nights. 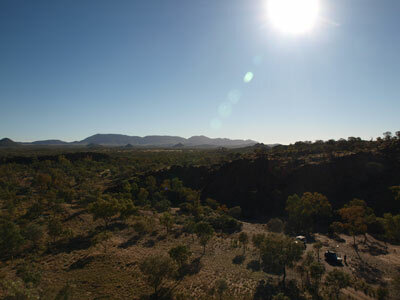 Today we have a lot to do as we are heading into Alice Springs and need to refuel, restock our food and drinks as well as do a lot of laundry. Peter F also has to see if he can vote in the Federal election. However, as we cannot buy takeaway liquor till 2 pm, we really do not need to be in Alice till about 10:30 am or so. As we go to depart, the couple up the other end of the camping area indicate to the group next to us that they have a flat battery and need a jump. As we leave, we get their Prado going as it is much easier for us to do it. 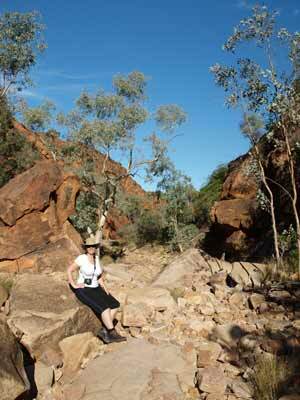 We leave Trephina Gorge at 8:50 am and stop at the Ghost Gum. 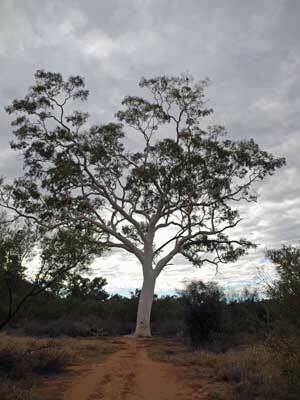 This is a huge white ghost gum which is just off the access track to the gorge. 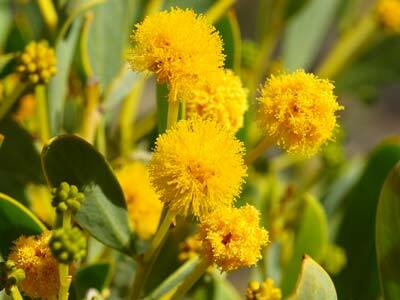 It is 33 metres tall and said to be 300 years old. Worth looking at. Back on the Ross Highway we head west towards Alice Springs. At 9:43 am we stop at Jessie Gap. 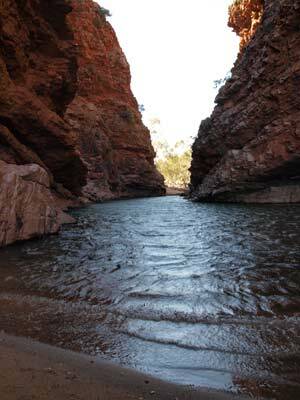 This is nowhere near as spectacular as the other gorges in the East or West McDonnell Ranges, but worth stopping to see. We leave at 9:55 am. Only a few kilometres down the road is Emily Gap which is similar. We leave here at 10:15 am and arrive in the Alice at 10:35 am. As we come in, we get messages from Peter T and talk to him. He has arrived in Alice the day before and is waiting on his wife Elly to fly in tomorrow. Peter F has to get his tyre fixed so first stop is a tyre place. We find Bridgestone and while he drops off the tyre, I spot a laundromat. This is not the one I had found on the web, but it will do. Kelly and I take all the washing and put it on and I decide to stay here to watch it. Kelly and Tomas head off to Woolworths to do the food shopping. While the washing machines are fairly quick, the dryers are not the best and it takes ages to complete the washing. I need to access the internet so I walk to McDonalds up the road but the battery in the laptop has gone flat and they do not have any power points (tight arses). I go back to the laundromat to charge the laptop. However, despite this, Kelly is still not back. Must be buying the whole place, but it will not fit in the car! Finally she returns and tells me Peter F has gone off to lunch with someone and Tomas is nowhere to be seen. She goes off to find him while I go back to McDonalds. Finally he appears and they go to McDonalds for lunch while I do some banking on the net. Peter T advises that he will catch up with us somewhere over the coming days. Peter F turns up and we go off to get fuel. I take 86.2 litres @ $1.469 a litre = $126.55. Could have easily got here from Boulia without the 50 litres I purchased at Jervois Station. The service station does not have a tap (incredible but true) so we have to find somewhere to get water for drinking etc. I have to get about 40 litres. 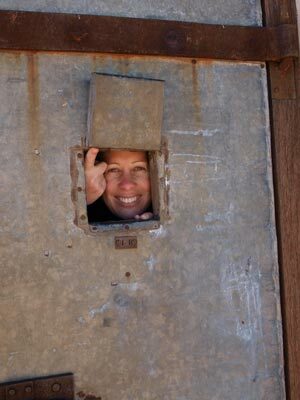 After driving around, we find a toilet block on the north side of town that has a tap inside the men's toilets. I restock. It is now just after 2 pm. We have seen why they have the late opening times, the pub opposite the toilets had a crowd of at least 50 Aborigines waiting for it to sell grog. We head back to the shopping centre and go to the Liquorland. 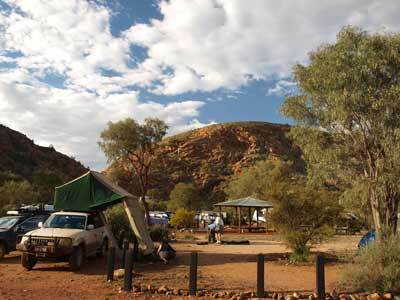 I get a carton of 30 XXXX Gold cans for a reasonable $40 as well as a bottle of sparkling wine for sunset at Uluru. However, I cannot get a cask of wine for Kelly as they are not allowed to sell casks till after 6 pm. You have to show photo ID to get served. This is scanned. I have no idea what they do, perhaps it goes to a central database to make sure you do not buy more than the permitted amount each day. While here, a funny but sad event occurs. The Aboriginal bloke in front of me has purchased the maximum two bottles of cleanskin wine when all of a sudden he dashes out of the store. The bloke at the other cash register does the same. Two coppers have pulled up on motorbikes outside. It is obvious that these two blokes are perhaps wanted for something or should not be drinking. The two blokes may have later come back for their grog. Anyway, I have to tell Kelly that there is no cask wine, but as she still has a lot left, it will probably not be a problem. From here we head to Anzac Hill. 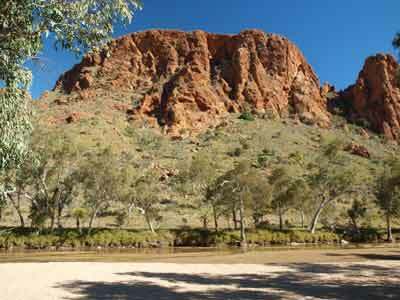 This is right on the north side of the CBD and gives great views over the whole of Alice Springs. 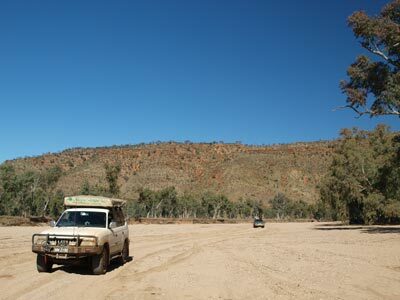 We leave here at 2:40 pm and head out on Larapinta Drive towards the West McDonnell Ranges. The roads for the next couple of days are virtually all tar, except for the access roads into some national parks. Our first stop is John Flynn's Grave. This is only a short distance out of town. John Flynn established the Australian Inland Mission and in 1928 he established the Royal Flying Doctor Service. After his death in 1951, his ashes were placed here. 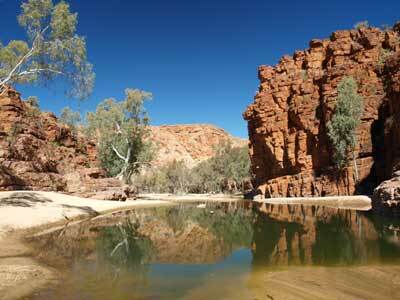 We are back on the road at 2:55 pm and at 3:15 pm we arrive at Simpsons Gap. We walk the short distance to the gap. We leave at 3:30 pm and at 4 pm we turn right onto Namatajira Drive. After 10 kilometres or so we find some fallen trees on the side of the road and we stop to cut some timber for a fire. We arrive at Ellery Creek Big Hole at 4:40 pm. This has a nice camping area, with a central camping area surrounded by an access road. We get a couple of good spots and shortly after more people arrive. Luckily we are here before them. There are flushing toilets, a shed but only one crappy fireplace which has huge holes cut in its bottom which let all the hot coals fall through where they are useless. There are also gas barbecues. We construct a small fireplace near the car so that we can cook dinner. It has become very windy and a small willy-willy rips through the camping area, pulling peoples tents down. The envelopes that I had just collected to put our camping fee in disappears and I never refind it. The wind comes and goes, very strong at times and then nothing. After we have the tents up, we have drinks and nibblies. I take pity on the bloke next to us. His name is Ben and he is from Brittany in France. 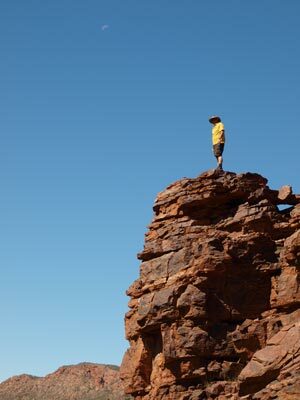 Ben is doing the Larapinta Trail walk and is on his 11th day. 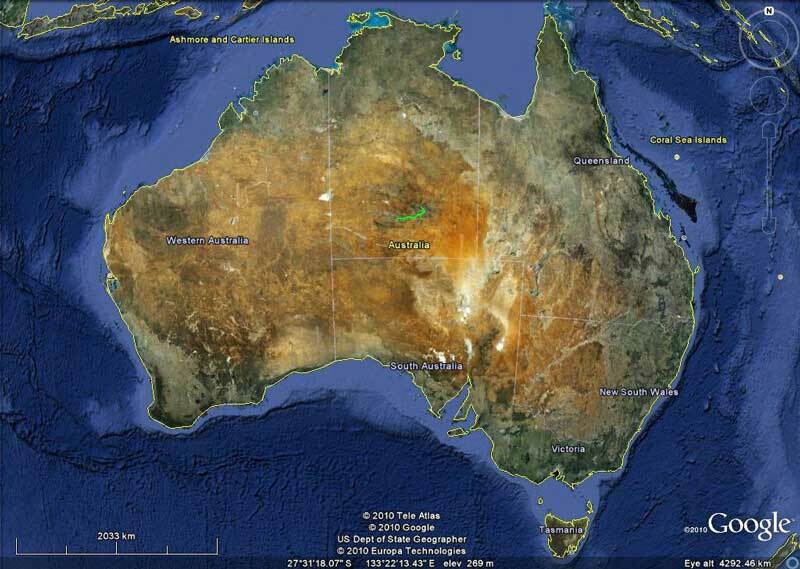 He has walked 110 kilometres so far. I give him a beer and he joins us in some chips, cheese and biscuits. After this I cook some lamb loin chops and sausages while Peter F cooks a pasta and Kelly makes a salad. Another great meal.